Here, in the Midwest, termites are beyond an annoying pest. Engineering News-Record (ENR), a construction industry trade journal, estimates that the cost to U.S. homeowners, annually reaches roughly $3.12 billion (citation). At GeoInspections we want to help you identify the problem before it costs you more money in repairs, that’s why we offer professional termite inspection in the entire KC metro. Termites can be a devastating situation to a home owner. The majority of the termite activity that goes on is unseen by the untrained eye. 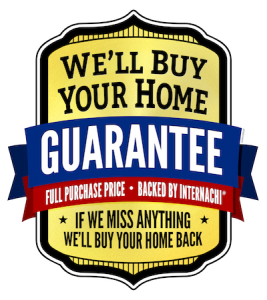 It can also absolutely be a deal breaker in a real estate transaction! Termites in Kansas City can also perhaps not be a problem at all if found and dealt with beforehand. Termites and other wood-destroying insects feed on wood and can damage the structural system of your home. They are a concern in any home with a wooden structure or components. Failure to properly identify and deal with the presence of wood-destroying insects can lead to damage to the structure and other wooden components of the house, creating the need for expensive repairs. There are several types of termites, some live underground and others live above ground on wood and other structures. Here in the Midwest, and especially the Kansas City metro, homeowners fight subterranean termites. Again, damage can cause a major problem and expense if untreated. These termites are the most common termite in the United States. A mature colony has from 60,000 to 300,000 workers. The average colony can consume a one foot length of 2×4 in 118 days. Subterranean termites can enter a home through a crack or void as small as 1/64″ in the slab or wall, any lumber in contact with the soil, an earth filled stoop, expansion joints, behind brick veneer, and through rigid foam insulation in contact with the soil. 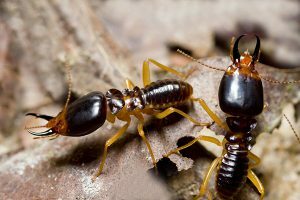 Subterranean termites have three primary needs: food, which to the Subterranean termite is anything made of cellulose (i.e. wood, cardboard, books); a constant source of moisture, and shelter which is provided to the soil. Subterranean termite workers are creamy white in appearance and the most plentiful caste in the colony. They forage for food to feed themselves and the rest of the colony. They create tunnels from mud (commonly called shelter tubes) to move above ground. The carpenter ant hollows out wood to create nests called galleries. Though they do not eat the wood, the boring activity can lead to structural damage in wood components. The by-product of the boring is called frass and looks similar to sawdust or pencil shavings. Frass is the most common evidence of carpenter ant infestation. The carpenter bee hollows out wood to create nests called galleries. The carpenter bee does not live in the nest but stays in the nest to rear their young. The nest opening is a perfect half-inch circle. The nest itself may extend anywhere from four (4) inches (for a new nest with one bee) to 10 feet (for older nests with several bees). Carpenter bees generally nest in weathered or unpainted wood. They lay their eggs in the nest and seal them with a chewed wood pulp plug. The bees then emerge from the hole in the Spring. If a ny past or present termite activity is discovered, it is very important to know whether it is still active, was it treated, and was the damaged wood repaired or replaced. In addition, it is important to know if that work was done correctly. These are some of the questions that only can be answered with a Certified Termite Inspector who comes to you with a strong carpentry background, which is exactly who you get with a termite inspection from GeoInspections. We would be more than happy to discuss any potential termite problems, questions, or concerns that you might have. My Termite License Number is N6847, which is maintained and regulated by the Missouri Department of Agriculture Department. In addition to our professional and experienced KC home inspection services, we are proud to also specialize in and offer termite inspection in Kansas City, Lee’s Summit and the KC metro. Call 816-506-0905 to schedule termite inspection in Kansas City, MO.